We had a lighter turnout than normal at this month's game day, but it was still a great time with several brand new games being played. The turnout comprised Rob, Roni, DJ, Erin, Michael C, Eric E, Steve, Judy, Kate, Eric C, Kurt, and Steph. Thanks to everyone for the awesome snacks and liquid refreshments. Thank you whoever for the carved out pumpkin (with the carving being a meeple). We started off the day with an auction game by Stefan Feld that I had somehow never played before. I enjoyed it and have already ordered a copy. Rob was an economic power house; I never should have let him buy the Bank. With only one coin going into the last auction, Erin was screwed out of several Ships that would have given her a much higher score and possibly the win. While waiting for us the finish The Speicherstadt, the other early arrivals got in a quick, close game of For Sale. I think that it was Michael and Eric's first play. Hopefully, they enjoyed this one, which is one of my favorite fillers. Our game was running longer than expected so the guys got in two quick games of Coloretto. DJ brought and taught this new, unique game by Antoine Bauza and Bruno Cathala based on the book The Little Prince. Erin and Roni had recently played it up at the Gaming Hoopla in Janesville, WI. For such a simple game, it involves surprisingly difficult choices with a lot of opportunities for "screw you" tile selections. I quite enjoyed it. Michael brought this brand new game of bluffing and variable character powers by Bruno Faidutti. It somewhat resembles Citadels and Witch's Brew, but is more hectic. I enjoyed it and would welcome the opportunity to play again. Eric arrived just in time to join Judy and Kate in a game of TtR 1910. The finish was close with Eric edging out Judy. 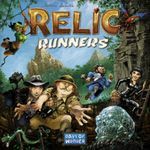 Michael has a prototype of Relic Runners for a limited time. He taught this upcoming Days of Wonder title to Eric and Erin, who apparently picked up on it quickly. 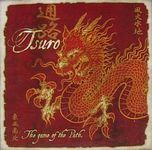 Eric C, Michael, and Erin got in two quick games of Tsuro while waiting for other games to finish. Eric won the first game, and he tied Michael in the second. 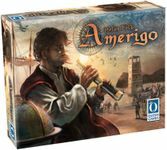 Kurt had just received his Kickstarter copy of Amerigo 24 hours previously. He lugged over this large game of exploration and exploitation and taught it to Eric and me. It not only has a cube tower resembling that of Shogun's dice tower, but also a rondel and pirates. What more could one ask for? In hindsight, I would have done a few things differently, like not being blocked out of ports by Steph so often and concentrating on large islands more. I really enjoyed this one and am looking forward to another play. Two quick games of this title that I had never heard of were played. I am not sure who brought and taught it, but I believe that Steve and Rob were new to the game. What did everyone think of it? 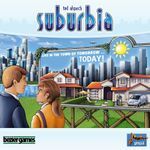 Suburbia saw its second play of the day with DJ edging out Roni with a score that eclipsed my upstairs win. This new title made another game day appearance with Erin introducing more players to it. I have yet to play it, but am looking forward to trying out another one by Stefan Feld. We had a great six-player game of Union Pacific. While Steve and I unsuccessfully wrestled Judy for control of the red company, Roni was a blatant monopolist in a medium sized company (yellow?). She also swiped the secondary shareholding of my green company with only a single share! Eric could have posed a serious end game threat to her, but was stopped by the relatively early appearance of the last dividend card. Jim and Jenn kindly lent this title to me for game day. 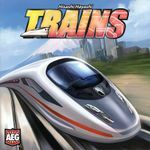 It is a fun combination of Dominion-like drafting and train building. I have played it once and enjoyed it. I am interested to learn what these players thought of it. With Halloween being less than two weeks away, we had to get in at least one horror themed game. The Last Night on Earth fit the bill nicely. Rob did a great job as the zombie player. For about the first 2/3rds of the game, the outlook for the humans was bleak. However, we made an end game rally and rushed the mansion in a frantic attempt to place our last two gasoline and ignite them. Alas, Rob had the perfect card to foil us on the last turn of the game. This was an epically close finish. Roni and Rob played a great game of Tichu that probably gave them something to talk about on the drive home. Several grand Tichus were scored, possibly one by Erin and Michael and two by Roni and Rob? DJ, Chris, Eric E - two 23s - "Extraordinary! Engraved in the crowd's memories." DJ and I wrapped up the night by teaching Hanabi to Eric. Despite good plays, we were not Legendary and had to settle with merely being Extraordinary. The traitor had a pretty simple win as Eric's character (a middle-aged female) turning into a giant two-headed snake on the upper floor. D.J. played a male professor while I played a 13 year old boy who like's bugs and does the professor's yard work. Rob played the role of a 9 year old girl who likes to play doctor with my character, Peter. The professor found a dog and a little girl during the setup and all three were killed in one swipe by the giant snake after the professor successfully cast a spell. Little Peter stood no chance against the giant snake and both him and Rob's 9 year old girl were swallowed up like hors d'oeuvres.